In order to achieve higher quality of effluent discharge, tertiary treatment methods such as using low pressure Microfiltration or either Ultrafiltration are applied in wastewater treatment plants. Both technologies operate based on similar sieving method as separation mechanism with the membrane acting as physical barrier to prevent contaminants from passing through. The efficiency to remove macromolecules and suspended matter can be assisted with use of biological or chemical agents that act as coagulant and bind together the material. 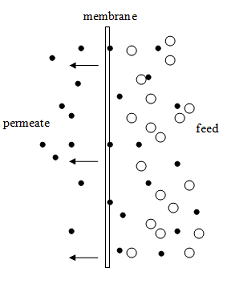 The difference between both is that and while microfiltration uses a lower pressure as driving force of 1 – 5 atm through symmetric microporous structure, ultrafiltration will need a higher pressure from 2 – 10 atm based on asymmetric microporous. Usually wastewater which has undergone secondary processes like dissolved air flotation, sedimentation and settling will need to meet certain influent quality in order to maximize the membranes’ usage and performance or else clogging and fouling will become major problems. In order avoid all these situations, pretreatment maybe necessary such as addition of chlorine so that build up of organic materials on the surface of membrane will not lead to immediate fouling. Furthermore both separation technologies also has its advantages in the sense that microorganisms such as bacteria will also get trapped along the filtration process and thus further needs such as ozone disinfection can be taken out. The choice of material for the membranes selected for use in wastewater tertiary treatment can vary and most common choices include cellulose polymers and polypropylene. For better filtration system, the modules should be in spiral mode so that this will allow more movement in the water and thus less chance of fouling. Microfiltration and ultrafiltration can also operate in different process configurations; the most common is the cross-flow or sometimes called recirculation movement whereby the objective is to allow wastewater that does not permeate through to mix with the incoming influent. Overall, in order to maintain a high performance system, a good and reliable unit should always have a backflush equipment or it also be improved by using chemical cleaning.